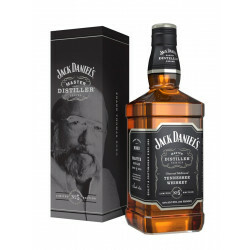 Jack Daniel's Master Distiller No. 5 is a tribute to Frank Bobo who oversaw the making of the famous Old No7 brand during the 1970s and especially the 1980s. Jack Daniel's Distillery is offering a fifth edition of its limited edition Jack Daniel's Master Distiller Tennessee Whiskey. This collection traces the long history of the brand, the oldest distillery registered in the United States, which saw only seven men overseeing the making of the legendary Tennessee Whiskey. This lineage goes back to Mr. Jack himself. Frank Bobo placed a high standard of quality in the distillery and always preferred honoring the production time determined by Mr Jack Daniel rather than meeting the growing demand. "I will rather ask people for their patience rather than forgiveness." Nose: mellow, with woody notes. Palate: round and balanced, with caramel and vanilla notes.